I am sitting on a rock looking out to sea, contemplating Mermaids. ‘Do you think you may have been a mermaid in a previous life’ ? I ask myself ‘Would you like to be a mermaid ‘? But last weekend I found myself heading west with my sister and a friend in search of a suitable seaworthy abode for a mermaid. Did I say ‘mermaid’ I meant ‘mermaids’. It all began with a photo! 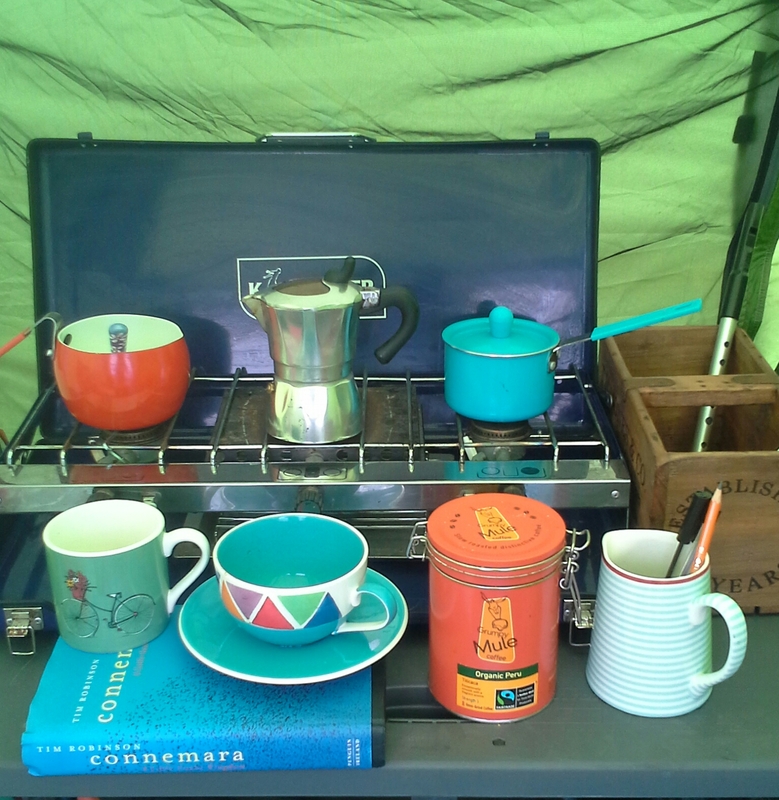 Of a tiny kitchen in a small green tent. It must have been the colours that caught the eye of a few Online friends. Or maybe it was the book on connemara or even the shiney coffee pot. It certainly looked like a inviting nest where one could crawl out of the small space and stand in the morning sun, stretch and greet the day, admire the view and plan a swim or a walk or a cycle. 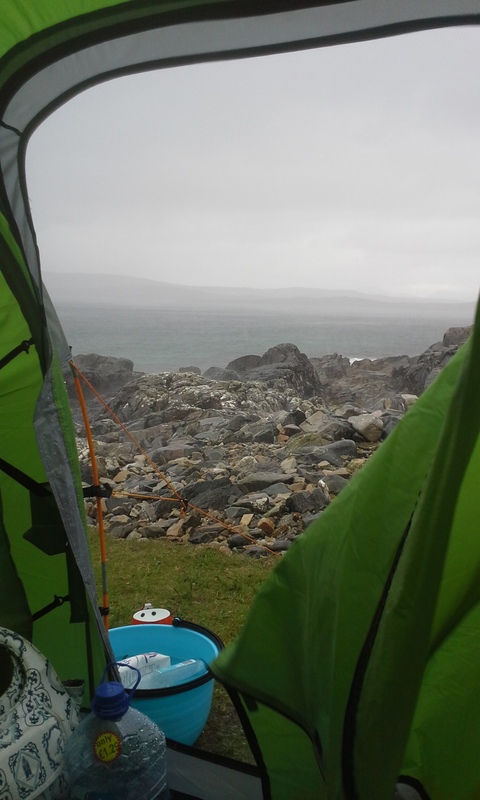 But what the photo failed to show was the northwesterly storm blowing outside, causing that small tent to dance and tug on its guy ropes, whipping up the waves and sending the diving terns skew ways. Yes! the photo which should have been a blur caused by the movement of flapping canvas which in turn led to shaking table as the wind pushed the side of the tent inwards was taken with a modern camera which had the ability of catching a frame and freezing all motion. I crawled out to check the guy ropes were keeping us attached firmly to the ground and righted the yellow bicycle which had blown over on it’s side (another dent to it’s already rusty battered frame), this was a place of rock. Back inside I made some order to my tiny kitchen, put on a pot of coffee, found my book (Tim Robinson’s ‘Connemara’) and settled myself comfortably upon my blow up bed and silk cushions to wait out the storm, hoping it wouldn’t take a turn for the worse, taking me and my accoutrements out to sea. In the midst of reading and sipping and waiting out the storm, I took the photo. And from that kitchen on that stormy day came the mermaid project. Whether it will flourish or flounder (pardon the pun) remains to be seen. I am a woman of enthusiasm. I open my mouth before I think things through. I even speak my thoughts out loud without realising it. This was all very well when I was young and had the energy to carry out my impetuous ideas. But I am older now and NOT wiser and even though my head is full with idea’s it doesn’t seem able to convince my brain that my body has slowed down. So I try to reign myself in a bit and strive to meditate. I feel it (meditation) will help me become one of those calm women who smile serenely and pause before replying. Who sensibly say ‘ I will think about it’ before committing themselves. ‘Lets meet here next year’ I typed with gusto on my trusty laptop to all those who gave positive feedback on my photo. 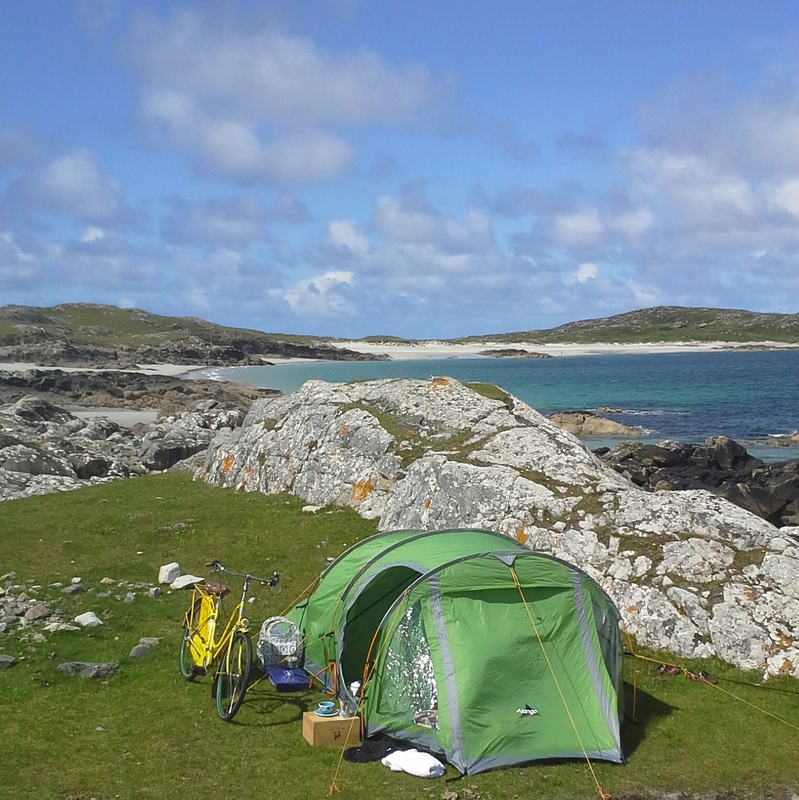 ‘Lets camp and chat and play music and swim and of course cycle’. (It was, after all through love of bicycles that we had originally met). ‘Yes yes yes!’ my mermaid friends typed back with equal enthusiasm. ‘Lets do all those things’! I was slightly taken aback ….and a bit scared by the exuberance and speed of their replies. I realised these mermaid ladies meant business. Now every irish person knows when someone says yes they mean no and vice versa. ‘Would you like a cup of tea’? Oh how you have been DYING for that cup of tea. It took marriage to a dutch man to learn that the above only pertained to Ireland and I learnt it the hard way! During my first visit to my new sister in law I politely said no to a lovely cup of freshly brewed coffee (we were still drinking instant in ireland in the home. You had to go to Bewleys or Roberts if you wanted fresh coffee and that was only in Dublin) and sat sadly while everyone sipped merrily at there’s. ‘I do’ I cried ‘but I was waiting to be asked a second time’. ‘A second time?’ He looked at me perplexed ‘Why do you need to be asked twice? If you didn’t want it the first time why would you want it when asked a second time?’. He was genuinely puzzled and I tried to explain how it was seen as polite in Ireland if you refused the first time. He thought that was stupid as well as confusing and even downright lying. You want something yet you say you don’t want it, just so you can appear polite. I tried to explain it was deeper than that. Irish people are extremely hospitable and would give you their last crumb. It is a sort of unspoken code that the guest understands that the host may actually be too poor to have extra food or drink in the house to offer. But back to the mermaids. I now hoped that the enthusiasm everyone was showing would, just like the northwest gale blowing around my tent the day of the photo, die down. But it didn’t and so in a panic I went to visit my very practical sister and get some advice. My very practical sister sat for a moment looking out to sea, the wind whipping her hair about her rosy cheeks. She thought awhile before turning back to me. ‘We will rent a castle’ She announced stoutly. ‘A castle on the sea. After All, If a castle can withstand northwesterly gales for over two hundred years, it will continue to withstand them, at least until the end of next june’. And that is how my very practical sister got entangled in the mermaid’s Tale too. The weather, mermaids are unlikely to get for their week’s camping. If I may, Steph, I’ll be after finishing my comment from yesterday. Mermaids in the Atlantic, off the coast of Connemara struck me as an impossible possibility. If they thrive there, they must be wearing bike helmets against the rocks and wet-suits against the cold. But then, who would go out of one’s way to look for them with all the romance bein under? As to the tea…I know that process well. My mother was 2nd generation Boston Irish, her grandmother from near Belfast I think and my dad was first generation Philadelphia Irish, his father Denis was from Cork city. Between them, while they never claimed it was Irish custom, we learned to pass on the first offer and then take the cookie or piece of cake closest to you and not be surveying the possibilities for the best piece! Now, if it is a wee dram of Jameson bein’ offered, there’d be no passin’ atall, don’t you know, and no shame is looking for seconds. Waiting for more Mermaid adventures. We west of Ireland mermaids are made of stern stuff and enjoy rough sea’s and unsure weather.Our meeting will be interesting and comes from a different group, the slow bike movement, so it is important that cycling will be part of this picture. thus being near the achill to westport greenway cycling road is important. spect we’ll be stopping for many a pint of guinness, delicious sea food and even that tot of Jameson enroute :)starting the next peice soon . thanks again for showing such interest in my writings . stephanie. I understand..and I’ll save my “stage Irish” expressions for entertaining family only. I spent 6 years in close proximity with a wonderful bunch of lads who could lay it on heavy and enjoy laughing at themselves, but serious men when it came to serious topics. I miss their laughter and their intellects, and envy their story-telling skills. Have a great day. You have a story-telling gift and the photos are fantastic.